Atwood, Christopher P. (2004). 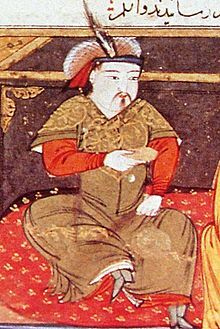 The Encyclopedia of Mongolia and the Mongol Empire. Facts on File, Inc. আইএসবিএন ০-৮১৬০-৪৬৭১-৯. Boyle, J.A., (Editor). The Cambridge History of Iran: Volume 5, The Saljuq and Mongol Periods. Cambridge University Press; Reissue edition (January 1, 1968). আইএসবিএন ০-৫২১-০৬৯৩৬-X. Morgan, David. The Mongols. Blackwell Publishers; Reprint edition, April 1990. আইএসবিএন ০-৬৩১-১৭৫৬৩-৬. Best for an overview of the wider context of medieval Mongol history and culture.